Apple is a company that almost always surprises its users with the new products it launches on the market, due to the latter, the last mouse model available for Apple computers (also known as Apple Magic Mouse) has been such a success. 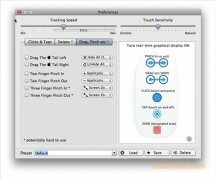 This device allows the user to control any application thanks to its touch surface, but, for the moment, Apple hasn't offered its users many configuration options, that is why Vlad Alexa has developed MagicPrefs. It's an application capable of allowing the user to configure any aspect of the mouse's control, from the movement speed or the sensitivity of the tactile pad, to the response of the system to certain gestures, allowing us to activate Spaces or Exposé by only swiping our finger over the surface of Magic Mouse. If you have one of these state-of-the-art mouses by Apple and you want to improve its functions, don't wait any longer to download MagicPrefs, a completely free application. It is only compatible with Mac OS X 10.6 Snow Leopard and above.